Today I had the pleasure of spending part of the afternoon with Kathy Fransisco, the newest Project Makeover nominee. This was our second closet clearing session and we still have a few more to go before the re-stying begins. Kathy, like so many of us women loves a bargain and she frequently comes home with bags of new clothes that she really doesn't need. Sound familiar? 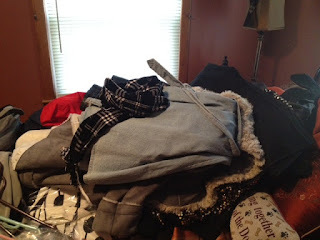 As Kathy and I weeded through her clothes and starting making mountainous piles of discards, we chatted about the shopping mistakes so many women make. Can you relate to this? When we see a great deal we think "well, even if I wear it once, it's worth it"...or "I like the color" (not noticing that the style is WRONG! )...or how about this one "if I don't wear it, I'll give it to someone else since it's so cheap". So what ends up happening? Our clothes take over our space and our life! We end up with way too many clothes that go unworn and sit in our closets accumulating dust. Putting outfits together becomes impossible since we can't see (or remember) what we have! Plus think of all the money we waste on so called "bargains". With all the $9.99 and $29.99 "deals" we think we've scoffed up, we end up throwing quite a bit of money down the drain. Kathy is SO ready to get rid of anything that doesn't work for her---yay Kathy! So off to work we went! Piece by piece I asked Kathy "Do you love this?...Does it fit"...Do you wear it?...Do you feel great in this?" If the answer was "no" to any of the above questions, out it went. 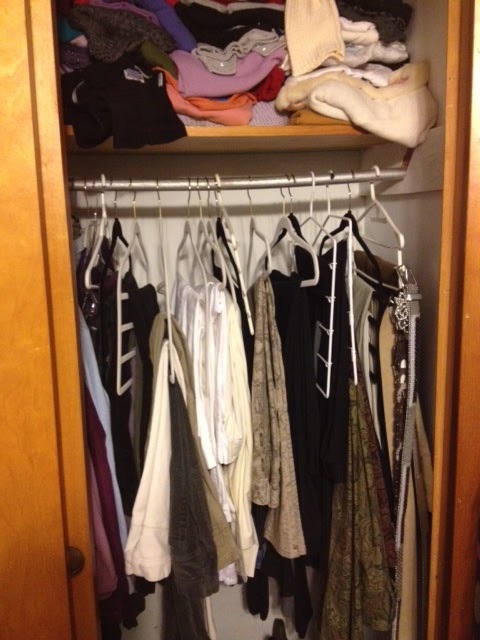 2 closets down. and a few more to go! Follow Kathy's makeover at Project Makeover and help us support amazing and inspirational women. 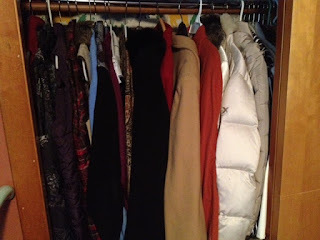 One of Kathy's closet chock full of sweater piles. The mountain of discards gets bigger and bigger! Kathy's jackets and coats are now all consolidated in one closet so she can see what she has.